FreqFinder is a frequency management app that accounts for the effects of intermodulation in regards to radio transmission. Add transmitters to your profile, configure their make and model, and select frequencies from the Compatible Channels list. Doing so will minimize intermodulation interference resulting from the interaction of transmitters in your profile. Intermodulation is a phenomenon that occurs whenever any harmonically complex signal passes through a non-linear signal path. The result is distortion that adds, in a predictable way, frequency content not present in the original signal. For the purpose of FreqFinder, this harmonically complex signal is the combination of 2 or more radio transmissions; the non-linear signal path is an overdriven receiver or transmitter. While the calculation of the intermodulation of all radio frequency content received by our antennas is incredibly complex, FreqFinder focuses on the most prominent intermodulation that will degrade performance and produce unwanted audio. FreqFinder is tool created to properly account for intermodulation phenomena resulting from the use of multiple radio transmitters. It is specifically designed for use by audio engineers on location with a focus on easily changing channels should one transmitter experience interference. Intermodulation distortion is the interaction of two frequencies to the effect of generating extra unwanted frequencies. The intermodulation products, as they are called, will cause interference for other transmitters configured to these extra frequencies. While intermodulation is a phenomenon that occurs in any non-linear signal path, its effects in radio transmission are subject to certain characteristics of radio transmitters and receivers and the manner in which they are used. This article discusses the practical aspects of intermodulation in radio transmission. It is important to understand that intermodulation can occur within both the transmitter and in the receiver as well as any gain stages between the antenna and the front end of each. In a receiver it is easy to see how an over driven receiver would be affected by intermodulation. However, the output amplifier of a transmitter is exposed to its RF environment and powerful signal can be absorbed into the amplifier and be retransmitted with intermodulation added. Even though intermodulation is created within the signal path of the radio equipment, it can still be broadcast and therefore still affect other radio systems otherwise not participating in the intermodulation generation. What does "order" and "number" mean in this context? Two important variables that describe any particular intermodulation product are the order and the number of frequencies involved in the product. The order, or the sum of the multiples of the frequencies, correlates with the severity of the intermodulation product. Usually 3rd order products are the products of most concern as they usually fall within the operating range of the original frequencies. 5th and 7th order products are weaker but still a possible factor in intermodulation problems. The number of frequencies involved in the product relates to the number of transmitters that must combine to generate the product. Because the usual cause of intermodulation issues is proximity of transmitters and larger numbers of transmitters tend to be farther away from each other, it is usually only pertinent to consider the products generated by 3 or fewer transmitters. What factors contribute to the severity of intermodulation? The fundamental variables which affect the severity of intermodulation are the amplitude of a signal and the dynamic range of the circuitry passing the signal. As long as a signal stays within the linear dynamic range of the signal path, no intermodulation will occur. How does FreqFinder account for intermodulation? When a user configures transmitters in his transmitter profile, FreqFinder calculates the frequencies of the resulting intermodulation of those transmitters. It then provides a list of channels (called "Compatible Channels") that would not be interfered with by those transmitters nor cause interference for those transmitters. Selecting channels exclusively from the "Compatible Channels" list will result in proper accounting of intermodulation for the transmitters in your transmitter profile. FreqFinder poses no artificial limits on the number channels that can be programmed. However, as more transmitters are added to the transmitter profile, more channels will be considered unusable by FreqFinder, so intermodulation itself limits the number of transmitters that can be used together. The number of transmitters that FreqFinder will find to be compatible together depends on FreqFinder's calculation settings. The compatible channel list provided by the transmitter manufacturer is not the same as FreqFinder's list. Why? Accounting for intermodulation is subject to degrees of conservatism. The added flexibility of computer calculation over a hard set of frequencies allows FreqFinder to be more conservative and yet provide more options in channel selection. By default, FreqFinder choses very conservative settings which can be dialed down should more channels be needed. What is the "7th Order Products" setting? FreqFinder's minimum settings only calculate up to and including 5th order intermodulation products in 2-transmitter combinations. Enabling 7th Order Products sets FreqFinder to account for up to and including 7th order intermodulation products. Enabling 7th Order Products makes FreqFinder more conservative resulting in fewer, more protected channel options. What is the "3 TX Products" setting? FreqFinder's minimum settings only calculate intermodulation productions generated by 2-transmitter combinations. 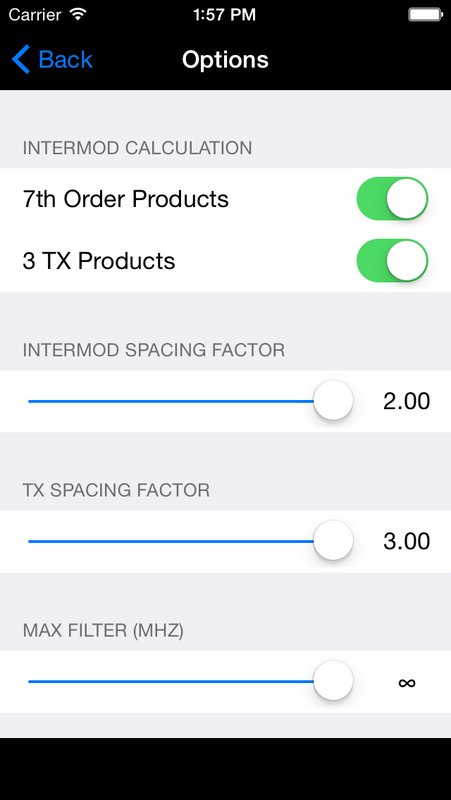 Enabling 3 TX Products sets FreqFinder to account for intermodulation products of the 3rd Order generated by 3-transmitter combinations. Enabling 3 TX Products makes FreqFinder more conservative resulting in fewer, more protected channel options. What is the "Intermod Spacing Factor" setting? This number is a multiplier that FreqFinder uses in determining the spacing between a transmitter and any given intermodulation product. The number itself is arbitrary and ranges from 0.5x - 2.0x. Increasing this number makes FreqFinder more conservative resulting in fewer, more protected channel options. What is the "TX Spacing Factor" setting? This number is a multiplier that FreqFinder uses to space two transmitters apart. FreqFinder sums the deviation of two transmitters and multiplies it by the TX Spacing Factor to determine the minimum spacing between those two transmitters. Some transmitter types have alternate minimum spacing which cannot not decreased but can be increased. What is the "Max Filter" setting? All radio equipment has a front end filter meant to tune out irrelevant incoming signals or band limit transmitted signals. As intermodulation occurs within the device, any signals filtered out can not contribute to intermodulation. For instance, Wifi radios (2.4Ghz & 5Ghz) rarely contribute to intermodulation in the UHF range (470-600 Mhz). This setting should be set to the largest front end filter in your system. This can be as small as the transmission bandwidth, but is usually the size of a given block, and can be larger if any multi-block devices are used, such as amplifying antennas or antenna distribution systems. Are you sure FreqFinder is accurate? FreqFinder uses the same method as the majority of intermodulation calculators. It is based on a simple equation, and this particular implementation caters to transmitter users on the go. Unfortunately, the standard method doesn't cover the whole story of intermodulation. There are many factors involved in the generation of intermodulation that are not part of FreqFinder's calculations because they are transient properties (distance, attenuation) or because they would require intimate details of every electronic component that a signal passes through. Nevertheless, FreqFinder and the standard calculation provide a reasonable level of protection against intermodulation in everyday use. What are the differences between FreqFinder and Intermodulation Analysis System (IAS)? Both FreqFinder and IAS use the standard intermodulation equation. By default FreqFinder is more conservative than IAS and will therefore provide fewer simultaneous channels than IAS. IAS also has more flexibility in the configuration of its calculation than FreqFinder does. IAS's method of operation is to upon calculation offer a number of channels that are all compatible with each other as well as with the list of previously selected transmitters. FreqFinder is centric around the individual transmitter and only offers options for one transmitter at a time. In short, IAS is designed to provide large numbers of compatible channels for larger installations. FreqFinder is designed for smaller numbers of transmitters for on-the-go configuration and reconfiguration. My transmitter is not included. When will it be added? It is not difficult to add a transmitter type as long as you can provide me with the channel list and frequency deviation. I usually can add it within a day or two. In particular Audio Ltd channel lists tend to be non-standard, so I frequently get requests to add a channel list which belongs to one person, and I'm happy to do so.